Young hero Bellamkonda Sai Srinivas is unstoppable. He is doing films at rapid speed. His upcoming film Saakshyam being directed by Sriwass is nearing completion. The production unit completed a schedule yesterday and final schedule is in pending. 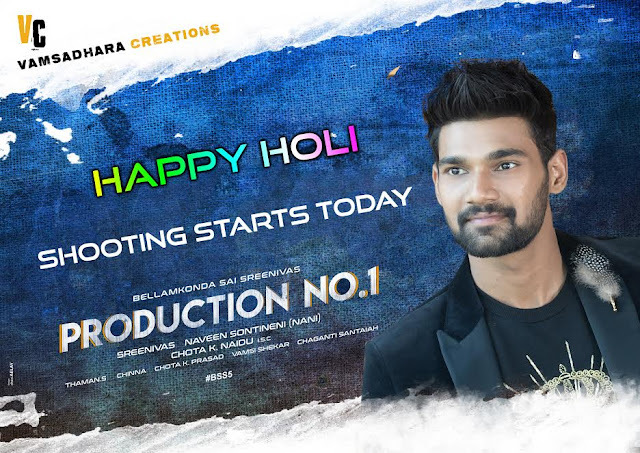 Meanwhile, Bellamkonda Srinivas’s new film with debut director Srinivas has begun today. Right now, a heavy action sequence is being shot under the choreography of Stunt Shiva. Srinivas who worked as co-director for many hits films is wielding the mega phone for the first time. Senior writer Abburi Ravi is penning dialogues for the film being produced by Naveen Sontineni (Nani) under Vamsadhara Creations banner. “Bellamkonda Srinivas is young but he is very professional when it comes to work. He is not taking any break to start shoot of our Production No 1 under the direction of first timer Srinivas who came up with an innovative concept. The film will have space for two heroines. We are glad to have top technicians like Abburi Ravi, Chota K Naidu and SS Thaman working for our film. Regular shoot of Vamsadhara Creations Production No 1 has begun today. Under the supervision of Stunt Shiva, a deadly action sequence is being shot,” informed producer Naveen Sontineni.